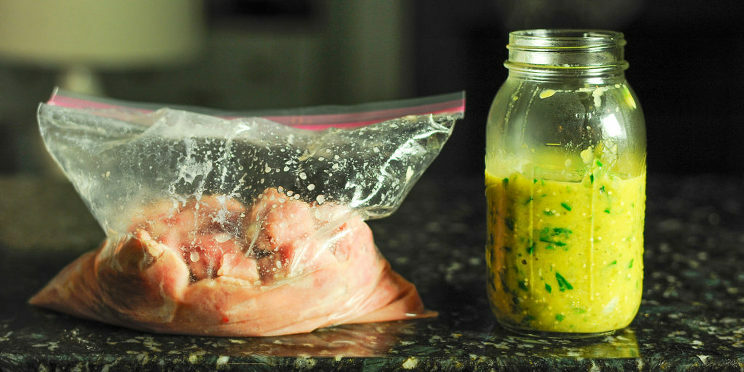 I love a good salsa verde! I fell in love with that stuff back when I lived in San Francisco after college. But once I moved back to Atlanta, I found it fairly difficult to find a good, fresh one. Often, they were sweetened with sugar, which is a weird choice on an ingredient in a salsa verde in my opinion. Anyway, I’m happy to say I’ve finally found one that I love! 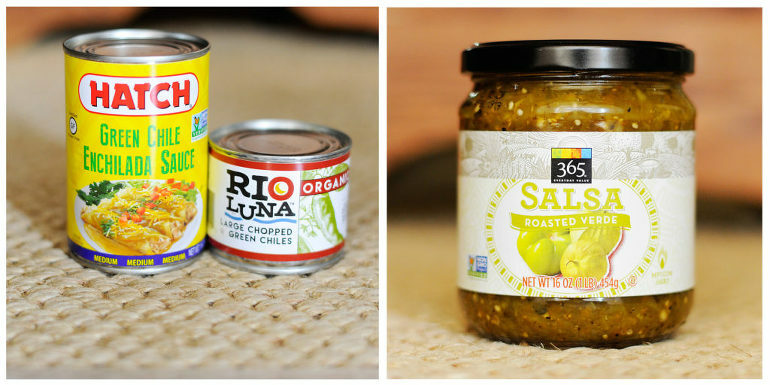 I used these three ingredients (see picture below) and mixed them with some blended tomatillos, (jalapenos if you’d like, just take the seeds out and it will be fairly mild), garlic, onion and cilantro, and it made for an amazing salsa verde!! I also love many crock pot recipes made with pork, but I always felt like when I used a pork shoulder (which is what most of the pork crock pot recipes call for), there was always just way too much fat to cut/pick out. My son is totally grossed out by big chunks of fat, as am I. So for this recipe, we used pork tenderloin (bite-sized pieces) and it was way better. As much as I am a fan of fat for flavor, I think we will be pork tenderloin for the crock pot from now it. I also feel like it saves time in the end. I love that the cauliflower made this so much thicker and heartier. You could also use white potatoes or a white beans if you prefer! You can use canned tomatillos or you can roast some fresh ones along with fresh jalapenos (peel off outer layer of the tomatillos, cut them in half, coat with avocado oil and bake on 400 for 10 min) if you would like. You can also prep this meal ahead of time. I blended tomatillos (and jalapenos), onions, garlic and cilantro (and jar of salsa verde, green enchilas sauce, and green chilies) ahead of time, so all I had to do the next morning was brown the meat, turn on the crock pot, place the meat in it, along with the sauce (salsa verde you’ve made) and let the crock pot do it’s magic! 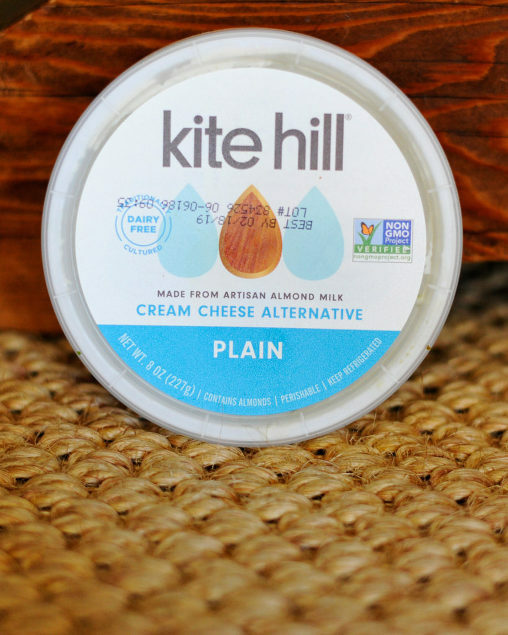 And I really loved this Kite Hill (dairy free) cream cheese with it. I think that is what really made this dish but the kids said I was “alone on that one”. But they did enjoy the stew with some avocado and hubby loved it with sour cream. I hope you all enjoy it too!! I found this after Whole Foods 365 and also Publix carries it…. In a medium sized skillet, add avocado oil and heat over medium high heat. Brown the sides of the pork (for about 2-3 minutes on each side) and add them to the slow cooker. 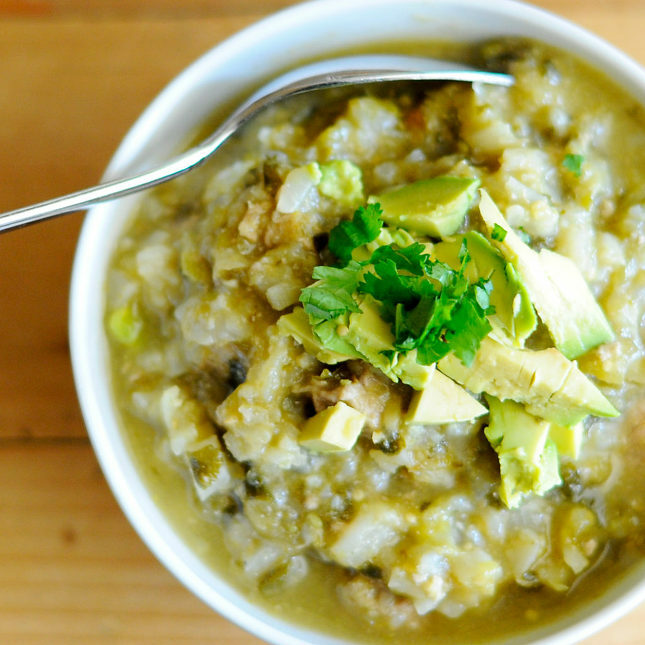 In a food processor add the tomatillos, onions, garlic and cilantro and blend until fairly smooth. 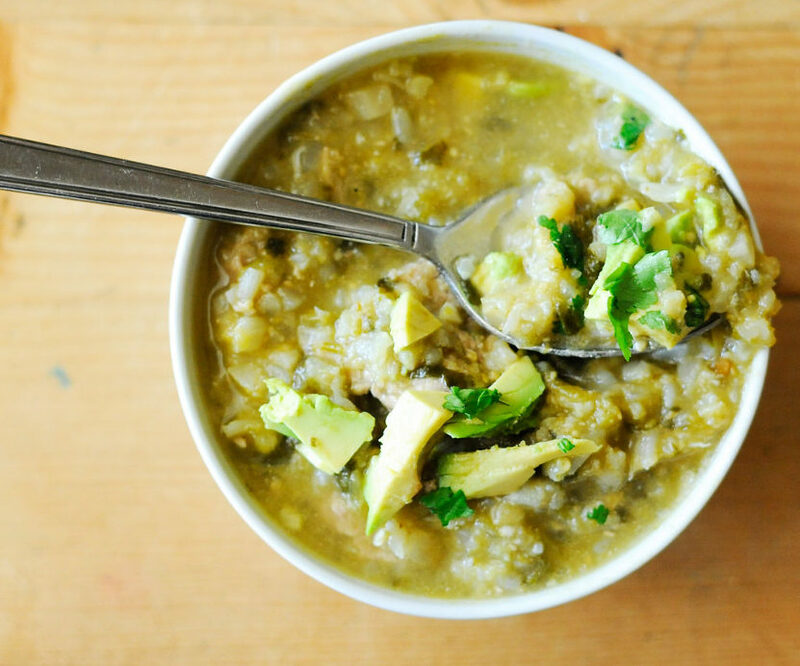 Add it to the slow cooker along with the cauliflower rice, green enchilada sauce, salsa verde, green chilies, cumin, dried oregano, and salt. Cook on low for 7-8 hours or on high for 5 until the is fork tender. Garnish with avocado, sour cream (or cream cheese :)) if desired.